I used to dread the first day of a new semester, as it meant introducing yourself in front of the whole class. I hated it, I felt incredibly self-conscious and embarrassed because I couldn’t think of anything special to say about myself. I would say some generic stuff and wrap it up somehow. It would sound really plain compared to all the interesting self-introduction of other students. Even during any casual conversation with friends, I would only listen to the other person and limit talking about myself because I didn’t feel good enough and I used to think that my life was less ‘happening’ than others. But I wanted to change this. I wanted to be more confident, I wanted to be proud of myself and I wanted to improve myself as a person. So I started making efforts to become more self-confident and not hesitate while talking about myself. For those of you who feel the same way and want to change the way you describe yourself, I have put together a list of the things that will help you to achieve that change. If you think you are “boring”, then make yourself interesting. It’s not going to happen on its own. You have to work for it. Make the effort to learn a new skill. You must open yourself up to new ideas and opportunities. Learn a new language, play a sport or take up a musical instrument. Start reading a book or acquire maximum knowledge on your favorite topic. Investing your time wisely and productively improves you as a person and makes you more aware of yourself. As a result, you become more confident which allows you to talk more about yourself. Faking confidence can actually help you get the much-needed boost to get past your inhibitions and work ahead. You’ll actually start believing that you are able to achieve what you want, and this belief will dictate your actions. And if you believe in yourself, you’ll steer your actions in the right direction and ultimately become the person you wanted to become. You’re better than you think. Don’t belittle yourself. Focus on your good qualities more than bad qualities. Respect yourself and don’t think you are unworthy. 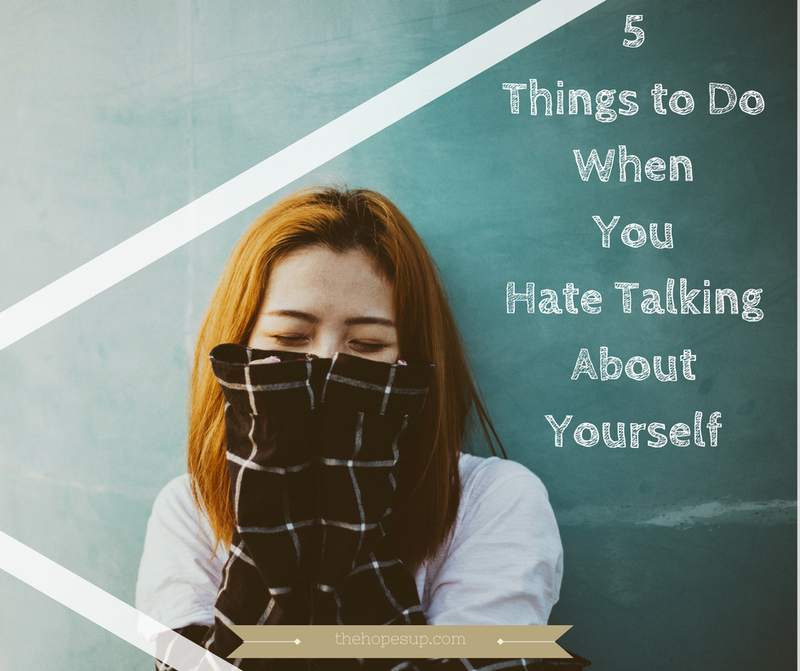 The hesitation of not talking about yourself comes from undermining yourself and constantly putting yourself down. Start loving yourself. Whatever good qualities you have are worth celebrating and are worth talking about. Minimize self-hate. It’s a big world, there are a lot of things that you can dislike, you don’t have to put yourself on that list. 4. Don’t be afraid of being judged. A lot of times I have hesitated to talk about myself because I was afraid that people might not like what I have to say, or might think I’m a weirdo or something like that. Don’t let that fear come in the way of you expressing your thoughts freely or talking about yourself. I eventually realized I was just being weird for no reason and people don’t really put that much thought into each and every word I say. Talking about yourself shouldn’t be a nerve-racking task; just keep it simple and real. 5. Remember the more you do it, the better you get. Because you often avoid talking about yourself, so when you actually HAVE to do it, you feel like you have screwed up. Love yourself, have fun and don’t overthink it, as only then you’ll be able to get more confident while talking about yourself. You have to actually start talking about yourself to get better at it. Expressing yourself is as important as listening to the other person. I find humor always helps a little. Good points Jigeesha, I was once a woman with a low self esteem, always doubting myself, confidence = 0. But confidence can be learned, no one born that way, it is learned. So I learned to be one confident woman. I am no longer that woman who hide and shied away from people, a woman who do not say anything unless someone talked to me first. Having confidence made me love myself more, not to an egotistical way offcourse, but appreciate myself in every thing I have achieved how small or big that may be. This is the treat every woman should have (will, man too).